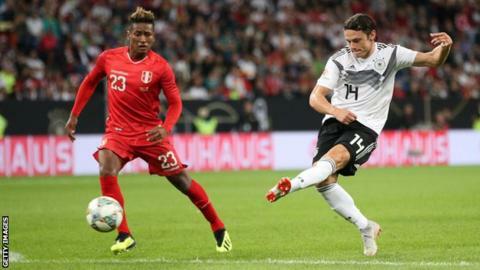 Nico Schulz scored an 85th-minute winner on his debut as Germany came from behind to beat Peru in a friendly. Hoffenheim's Schulz punished a poor clearance with a finish that squirmed under goalkeeper Pedro Gallese. Peru, who played at their first World Cup finals in 26 years this summer, took a shock lead through full-back Luis Advincula's low, drilled effort. But Germany levelled before half-time through Julian Brandt's dinked finish with Schulz netting late on. Match ends, Germany 2, Peru 1. Second Half ends, Germany 2, Peru 1. Attempt missed. Sergio Peña (Peru) right footed shot from outside the box is high and wide to the right. Foul by Nico Schulz (Germany). Corner, Peru. Conceded by Antonio Rüdiger. Foul by Kai Havertz (Germany). Horacio Calcaterra (Peru) wins a free kick in the attacking half. Offside, Germany. Niklas Süle tries a through ball, but Thomas Müller is caught offside. Substitution, Germany. Kai Havertz replaces Timo Werner. Attempt missed. Nils Petersen (Germany) header from the centre of the box misses to the right. Assisted by Julian Draxler with a cross following a corner. Corner, Germany. Conceded by Pedro Gallese. Attempt saved. Timo Werner (Germany) left footed shot from a difficult angle on the left is saved in the bottom left corner. Niklas Süle (Germany) wins a free kick in the defensive half. Substitution, Peru. Sergio Peña replaces Raúl Ruidíaz. Goal! Germany 2, Peru 1. Nico Schulz (Germany) left footed shot from outside the box to the bottom right corner. Assisted by Nils Petersen. Substitution, Germany. Thomas Müller replaces Ilkay Gündogan. Joshua Kimmich (Germany) wins a free kick in the defensive half. Attempt missed. Julian Draxler (Germany) right footed shot from outside the box is too high. Assisted by Toni Kroos following a corner. Corner, Germany. Conceded by Miguel Araujo. Delay in match Julian Draxler (Germany) because of an injury. Attempt missed. Nils Petersen (Germany) header from the centre of the box misses to the left. Assisted by Thilo Kehrer with a cross. Christian Cueva (Peru) wins a free kick on the right wing. Substitution, Peru. Horacio Calcaterra replaces Yoshimar Yotún. Delay in match Luis Advíncula (Peru) because of an injury. Attempt blocked. Nils Petersen (Germany) left footed shot from the centre of the box is blocked. Assisted by Antonio Rüdiger. Foul by Pedro Aquino (Peru). Substitution, Germany. Thilo Kehrer replaces Matthias Ginter. Substitution, Germany. Nils Petersen replaces Julian Brandt. Substitution, Peru. Marcos Johan López replaces Edison Flores because of an injury.